smooth external angle of Mandelbrot set? 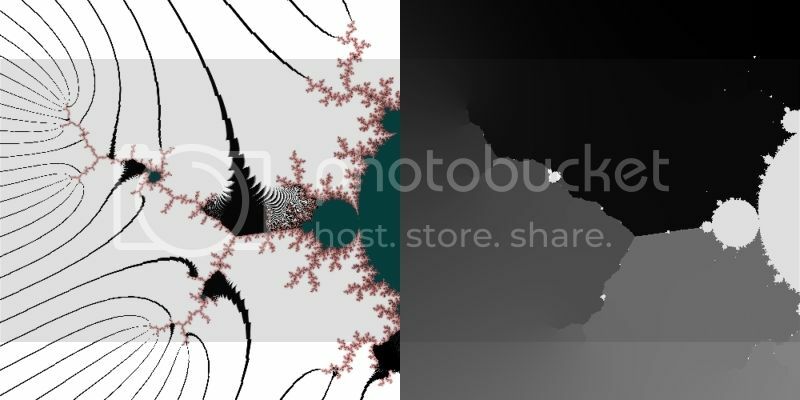 Welcome to Fractal Forums > Fractal Software > Programming > smooth external angle of Mandelbrot set? Does anyone know of a way to calculate a smooth field representing the external angle of the Mandelbrot set? Or any source code to point me towards? I have found many mathematical explanations but a lot of it is over my head. I'm not looking for the fastest way, just the easiest to understand. This site http://eventoneresearch.com/ has exactly what I'm looking for, the "field gradient". But it looks like their technique is patented. Any help is much appreciated, thanks! Re: smooth external angle of Mandelbrot set? Check out Gnofract4D. Has lots of coloring methods, all open source. I thought that should be simple, based on a "binary decomposition". Every iteration provides another bit of external angle, from most significant to least significant. It doesn't quite work, but it comes tantalizingly close. Here is the code anyway, in case I only made some stupid error which others might spot. But it could also be the case that my understanding of the idea only really applies to Julia sets, not to the Mandelbrot set. I'm not looking for the fastest way, just the easiest to understand. For each exterior pixel, trace its external ray through the C plane outwards accumulating bits in reverse order as you pass each dwell band - once the ray endpoint exceeds the bailout radius then reverse the bitstring. That gives you a path through the binary decomposition grid, you can use the final angle of the original iterate (once it passes the bailout radius) to get local coordinates within each binary decomposition cell for a bit more smoothing. http://www.math.nagoya-u.ac.jp/~kawahira/programs/mandel-exray.pdf has an algorithm for tracing rays from outwards in, it needs a bit of fiddling to trace from inwards out - in particular when crossing dwell bands you need to check which of the two angle doubling preimages is closer to the current ray endpoint (which you choose determines one bit of the output angle bitstring). Wow, that's really cool! This opens up the door for some cool texture effects. I realise I'm a little late to this but I've been away from fractaling for a while. I wrote this a while ago and I spent a long time fiddling to get my version correct to as great a depth as possible. ; Thanks to Chris Hayton for showing me how to fix the "off-by-one" problems. title = "MMF3 Field Lines (use high bailouts)"
; changing the y (imag) location very slightly." have the divergence set correctly and are using a high bailout)." caption = "Degree of divergence"
for z^2+c, 3 for z^3+c etc." hint = "Enable for correct rendering of Julia Sets." Density' as a whole integer >=1." caption = "Fix 'Start' iteration"
caption = "Fix Field Lines"
error but is quite effective at correcting some areas." 'Fix it' option quite interesting." Theere's a later version of my formula for field lines - though somewhat extended to include smooth iteration, distance estimation and distance estimation angles in my class formulas for UF - mmf.ulb called "MMF Field Estimator"
It's a UF class formula so not quite so easy to follow but I think it should be clear enough. I boiled down "corrections" to field lines that work in most places but at the moment require manual adjustment to work properly - these are the two parameters that can be modified by the user to fix errors in the field lines, unfortunately you can't always fix them everywhere in view even then but this is about as close as you can get I think. That looks nice, like arms scanning/touching the 2D boundary of the set. Also reminds me of synapsis, or how do you call those neuron-ends in our brain? I don't know about triangle inequality average, the pictures I found looks related but different. So the first thing I did was to get a binary version working, based on adding bits to a fractional angle. I used the source code found here: http://www.mndynamics.com/indexp.html to get a working version. The resulting grayscale image was very smooth (shown by the contour lines) but it's pretty obvious that it doesn't capture the complexity of the boundary. Then I found a formula for calculating the gradient of the potential (smoothed iteration count) at this site: http://linas.org/art-gallery/escape/ray.html So, for a given c-value in the plane, I would get the distance to the set using the standard distance estimation, and then take a step of that length going down the gradient. This would give me a new c-value, where I would find the new distance and gradient and take another step, until c was very far from the origin. Then, I would plot the original pixel with the angle of the distant c-value. The resulting grayscale image looked just as smooth as the binary version, and it captured the detail at the boundary. However, when I ran contour lines along it there was obvious errors creeping in from taking too large of a step. I realized that this was a case of Euler integration, so I knew I could improve the accuracy by switching to Runge-Kutta instead. Also, I limit the step size to a fraction of the distance, and I give a maximum cutoff. Limiting the step size along with using Runge-Kutta gave a result just as smooth as the binary method, but it captures the boundary (and I actually understand what it's doing LOL). Here is a c++ function to get the gradient of a c-value based on the formulas given by Linas Vepstas. The gradient is returned by reference to the variables gzx and gzy. I also return the length and derivative values by reference to make it work with my other function below. And here is a function that uses the getGradeint function to perform Runge-Kutta integration and find the external angle. It's assumed that the point has already been checked for being outside the set. which was way too slow.